Sometime ago, I wrote about a number of my favourite Queen's Bohemian Rhapsody parody which included the one made by The Muppets. Then, came this parody...in fuken Rage Comic form. What a great tribute from one of the greatest Internet sub-cultures to the one of the greatest songs in the world. Me gusta. So, I got a friend who is a big fan of My Little Pony and he - don’t ask why he love the show - shared this video. Now, before you shrugged off and say, “Ala, he just wants to justify himself for watching the show,”; seriously, just take a look at the video below. You might learn couple of awesome science stuff especially if you skip physics classes during high school. Now...I feel like watching the show already. Damn you, Nazrin. 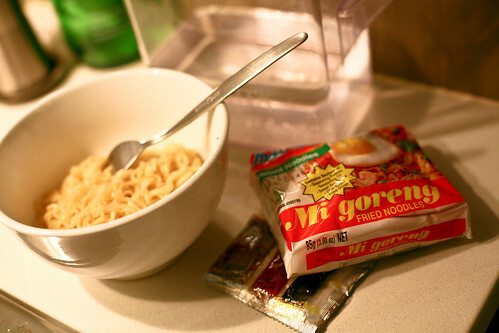 Damn son, I love Indomie. Hasn’t had it in a while though. It is ok, I can imagine eating it right now while listening to the song below. Feels good, mang. ...or more like a BMX park. The guys at Nike 6.0 - the sporting company’s extreme sports arm - UK took over a decommissioned swimming pool and turn it into massive riedable park for BMX. They even opened it for public to ride until the swimming pool is closed for good sometime in June. So, if you somehow in UK and a maniac on the pedal, check out the The Pool before it’s gone. Music Monday: Hujan, Inspektor Remos dan Video Klipnya Yang Ala-Scott Pilgrim. One of the better Malaysian's music outfit out there came out with one of the better Malaysian's music video as well. Fair enough. Many can't help but to spot the similarities between the video and the awesome movie that is Scott Pilgrim Vs. The World especially during the fight scenes towards the end of the MV. Nevertheless, it was still an awesome vid. At least it's not a straight photostat copy from the movie, heh. Slap a new processor, a touch screen and bam, you get yourself the new BlackBerry Bold 99xx series. Make it slimmer while you at it as well. Announced earlier this week at the on-going Blackberry World in Orlando, the new series will be available in two models: Bold 9930 for CDMA markets and Bold 9900 for GSM markets (Malaysia belongs to this one). Powered by a 1.2GHz Qualcomm Snapdragon processor, the release of this series also marked the arrival of BlackBerry’s latest operating system, the BlackBerry 7. If you thinking “well, I should just wait for my current BB to receive the new OS”, sorry son, the new OS will only be available in newer devices since it uses hardware acceleration. That being said, there are actually more to the new Blackberry Bold Touch(es) rather than just slimmer body and new hardware, so hit the jump to find out more about it from the full press release directly from RIM’s mothership. I’m pretty sure that by now you guys have got to know the world phenomenon that is the NYAN CAT. If you haven't...well, where the feck have you been? Fast, go click this link: www.nyan.cat. Now that you’ve met the rainbow pooping cat with poptart body that walked across the universe accompanied by background song, it is time to meet an awesome guitar cover of it. Enjoice! Imagine if this really happens. I can hear the sound of broken glasses everywhere as the fairy tale royal wedding dreams of women everywhere are blown away to dust. LOL. Malaysia are pretty blessed this year with tons of international bands/performers are scheduled to (or already have) serenaded their fans at this side of the world and I felt pretty grateful that many of them are actually my personal favourites; like Deftones last February. While I might have missed Bruno Mars last month, few days ago I managed to catch yet another of my favourite outfit, Maroon 5. Check out more from the first visit ever from Maroon 5 to Malaysia – setlist, videos and my thought of the show – by clicking that read more link. Infinite thanks to the music lovers at HTC Malaysia and Maxis for pimping me up with passes to catch one of my favourite bands around.